Are you tired of hauling off the trash? Would you like to work with a professional trash pick-up service but don’t know who to call? Is your current container service just not working out? If you answered yes to any of these questions, it’s time to call Rural Garbage Service in Lancaster, SC. 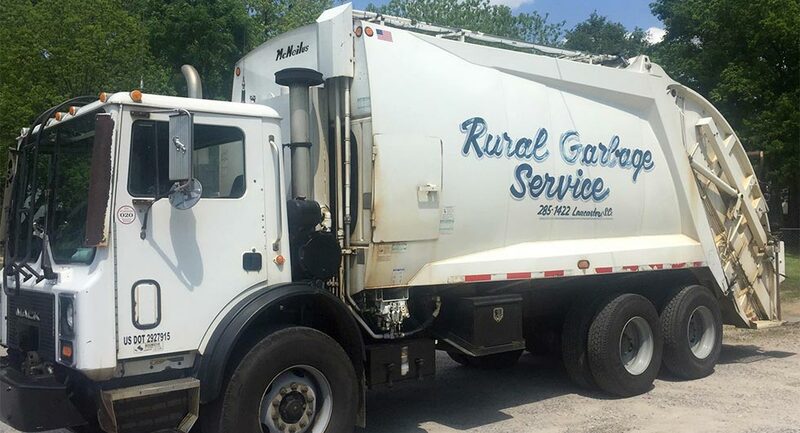 Here at Rural Garbage Service, our family-owned business is dedicated to serving our community by keeping your property clean and sanitary. When you work with us, you get exactly what you’re looking for: attentive service combined with excellent customer care. We promise that our crews will collect your trash on schedule, be careful when we’re at your location, and dispose of your trash properly. Whether you’re a homeowner or business owner, you don’t want unwanted waste and trash scattered about your property. This is where we can help. We are your local hometown garbage collector and we have been since 1958. We provide residents and business owners in our community first-rate garbage disposal services, including garbage collection, dumpster rental, trash container services, and emergency garbage pick-up. We welcome new clients, including churches, restaurants, convenience stores, apartments, and construction companies. Our routes run throughout Lancaster County, including Kershaw, Heath Springs, Van Wyck, Indian Land, Buford, Taxahaw, Tradesville, Flat Creek, Antioch, and Rich Hill. Save yourself the time and trouble needed to take off the trash. Get a trash pick-up service that’s dedicated to providing your home or business the very best in trash collection services. Call Rural Garbage Services to learn more about options and schedules. Owner Joe T. Dunlap and his friendly staff are ready and waiting to help with all your household and commercial garbage removal needs in Lancaster County, SC. Once you start working with us you’ll see that our service can’t be matched.